Frederick Wuensch’s Mind Unseated by a Tragedy. 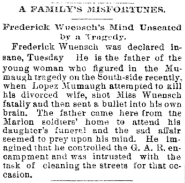 Frederick Wuensch was declared insane, Tuesday He is the father of the young woman who figured in the Mumaugh tragedy on the South-side recently, when Lopez Mumaugh attempted to kill his divorced wife, shot Miss Wuensch fatally and then sent a bullet into his own brain. The father came here from the Marion soldiers’ home to attend his daughter’s funeral and the sad affair seemed to prey upon his mind. He imagined that he controlled the G. A. R. encampment and was intrusted with the task of cleaning the streets for that occasion.